Last week I went to Blackie Spit in Crescent Beach to photograph birds, the estuary, and whatever else I could find. I specifically chose an evening at high tide as I have previously been here and sometimes the canals and flats are not nearly as photogenic with mud, dry/crusty algae, and other low tide qualities. 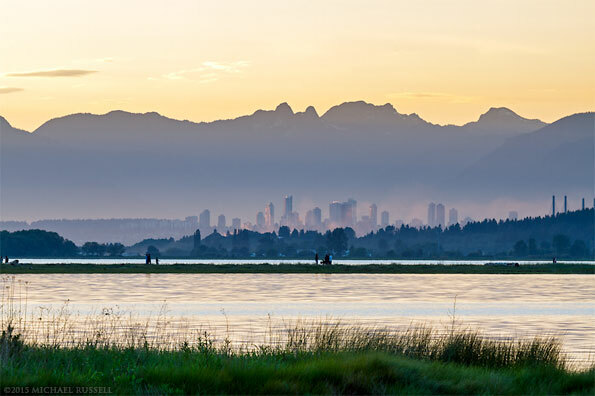 This was one of the views near sunset – the buildings of Burnaby’s Metrotown area with Boundary Bay in the foreground, and the Northshore Mountains in the background. A friend initially thought this could be the buildings of downtown Vancouver but Google Earth confirmed this is indeed Burnaby. This photo illustrates one of the things I like about this region, mo matter where you are there is likely a view of the mountains even when many kilometers away. The panorama below shows a bit of a wider view of the area I photographed, including more of the mountains and some of the old dock pilings (I presume) left over from old infrastructure. For more of my Mountain photographs visit the Mountain Photos Gallery in my Image Library. Have visited southern British Columbia since 1969 and I yet have had such a wonderful opportunity to examine such great photo albums.